I say cheaper because a pig's head is usually cheaper than its other parts. 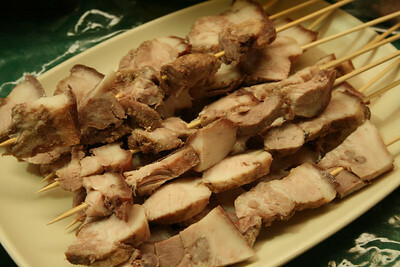 What my SIL used here is the same part she uses for tokwa't baboy, and those are the pig's cheeks and jowls. It looks like it's a lot of fat but not really. Just boil the meat seasoned and then cut into pieces big enough to be skewered with a stick. Then grill as usual with your favorite sauce (we even grilled ours on a grill over a pan of some water on the gas stove, which used up a lot of gas, but also resulted in no charring and crispy greatness).